Last week the German publication Die Welt carried a notable article, “Ukraine in a Three-Front War,” by Gerhard Gnauck and Silke Muelherr about the Ukraine-EU summit. As one of the authors, Gnauck, knows the situation in Ukraine very well, it is worthwhile to discuss the three items he focuses on. They are about obstacles on the way to Ukraine’s integration with Europe. The first one is more or less clear – it is the factor of the north-eastern partner. “Russia is doing its utmost to stop the expansion of EU influence onto the east and, hence, the promotion of democracy and principles of a rule-of-law state. All the signals coming from Russia reveal a course towards post-Soviet reintegration,” the journalists say. During the abovementioned summit, Ukraine not only confirmed for the fourth time its Euro-integration course, but also pledged to meet a number of conditions to be able to sign the Association Agreement between Ukraine and the European Union. This is planned to be done in November this year at the Eastern Partnership summit to be held in Vilnius. As is known, Russia opposes a rapprochement between Ukraine and the European Union. What steps can Moscow take to thwart the signing of the Ukraine-EU agreement? As far as the No. 2 item is concerned, it is worthwhile to recall the well-known British foreign-affairs journalist Lancelot Lawton who emphasized the importance of the “Ukrainian question” for Europe as long ago as in the early 1930s. In his opinion, it was extremely necessary for British policies in the East to include Ukraine in the system of Western Europe. “Without an independent Ukraine, European progress and peace in the world is impossible,” he wrote. 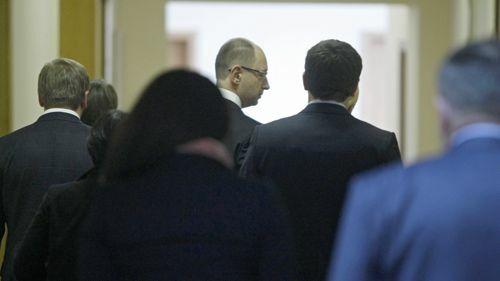 I think the absolute majority of European politicians have a certain immunity to critical information about Tymoshenko,” political scientist Volodymyr Fesenko says. “But this does not mean they view Tymoshenko as a political angel. They are aware of her numerous problems, mistakes, and sins. One of the reasons why Europe recognized Yanukovych’s victory so fast was disappointment with Yushchenko and Tymoshenko. Nevertheless, Tymoshenko is so far regarded as victim. And the ‘Shcherban case’ is unlikely to radically change the attitude to Tymoshenko. So far, the case evidence and witness testimonies raise more questions than give answers. Indeed, this item deserves a closer and more profound examination. For the opposition and the government seem to have made a joint statement about Ukraine’s Euro-integration aspirations on the eve of the summit. Why do the article authors believe that the opposition is a problem on the leadership’s way to Euro-integration? What does this mean? “I do not think the opposition is the main obstacle on the way to integration with Europe. Yet there is really a problem. For example, there are some problems that should be solved in parliament to meet the so-called ‘Fuele criteria.’ A compromise will have to be reached here. Is the opposition prepared for this? What will prevail – the desire to work for European integration or the desire to work for purely oppositional or even narrow-party interests? It is an open question. Nor do I see any preparedness for a compromise in the key matters linked to election law reform. No compromise will mean that one of the key criteria will not be met. What we need is constructive cooperation between the government and the opposition. Our society is inclined to believe that the government is bad and the opposition is good, one should side with the latter. But if the opposition continues to disregard the key problems, such as, for example, the high-profile “Gongadze case,” this may lead to a situation when the opposition will hinder the plans of Euro-integration and Viktor Yanukovych will come up as chief Euro-integrator and unifier of Ukrainian lands. This is quite possible.